Bedroom vanities are capable of refreshing your bedroom with an aesthetic and captivating beauty. Having an elegant vanity set that comes with high functionality is as important as having a perfect look that fits your apartment. What you need is the right vanity table you can assemble, store and display your makeup. So at this point you are probably thinking, I’m there, I get it, but how can I get the right vanity table? How do I get to know the best makeup table that fits my bedroom, and has enough space for my stuff? We have put together a detailed review of six best makeup vanity sets that will turn your bedroom into a perfect sanctuary. Let’s start by taking a look at each one of them. If you don’t want to compromise price for quality, then Bobkona St. Croix Vanity Set Stool is the best deal for you. The “St. Croix” vanity collection comes with a unique set of stylish design that is so attractive. The vanity table has a lot of great and unique features that will add a classy touch to your décor. The vanity table is made up of a foldout mirror that extends on both sides of the right angles. It has five drawers, and a matching stool shielded in a Plush Fabric.The St. Croix Vanity set comes with a lot of space on the top that can carry a good number of makeups. What Makes This Vanity Set So Great? One of the great features of this vanity set is the ease to assemble the table. The bulk of the installation has been taken care of by the manufacturer. So, you can quickly assemble the rest of the bedroom vanity without exerting so much energy. The St. Croix Vanity set fits all age and size. The mirrored vanity table set is suitable for teens and adult. The finishing touch of the product is beautiful and elegant. The vanity desk with mirror comes with great flexibility. You can add a personal touch to bring out the desired style you have always wanted. The weight of the vanity is quite heavy. There are a few hidden scratches in some discolored areas. The drawers sometimes fail to slide out easily which is a bit frustrating. This vanity set comes with excellent and attractive white color that can beautify your room. 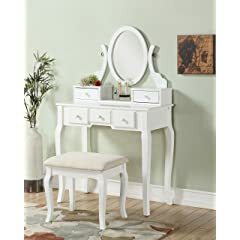 The white vanity also has an easy to follow guild on how you can assemble your vanity set with ease. This fashionable and modern vanity table comes with three storage drawers and swivel adjustable mirrors. It is perfect for keeping all of your jewelry. Additionally, the Roundhill Furniture Ribbon Wood Make-Up Vanity Table has a wooden stool that comes with an upholstered seat that is certain to highlight your bedroom, and gives it that elegant feel. The shipping speed is very fast. You are sure of getting your orders on time. It may look so tiny at first sight, especially when you’re yet to assemble it, but it is perfect and ideal for all size. The vanity has enough space for all your stuff. The mirror fits perfectly with the stool. It’s pretty easy to assemble. You’re sure of getting your order securely packaged. You can easily scratch the top of the desk, so be careful when handling it. The vanity might come with some missing pegs. The backside of the white vanity set might come with cracks on it. 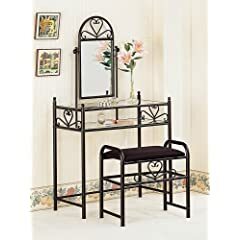 Coaster Vanity Table Set is a beautiful vanity set that is made up of solid Black wrought iron that gives the vanity an elegant and classic feel. Of course, it is an eye-catching mirrored vanity table that comes with an adorable design for your bedroom. The vanity comes with a well-designed storage shelf and glass top. The Coaster Vanity Table Set in Black comes with a well-decorated seat in a black fashioned iron heart shape that is sheltered by a black plush fabric. The desk is pretty high and fits perfectly if you are tall. Compared to other vanities, Coaster Vanity Table Set is a lightweight & sturdy vanity set. The bottom and top shelf have a lot of storage space. It takes time to figure out the right place for each screw. The instructional guild is not too detailed and easy to follow. You’d need an extra hand to get the seat held tight as the hand held screw driver seems inadequate. 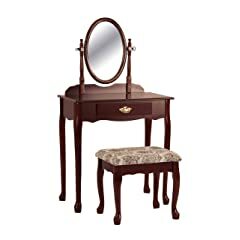 If you are looking for a high mirrored vanity table that will add elegance and style to your bedroom, then you should consider Tribesigns Vanity Makeup Table Set with Stool and Mirror. The vanity is made up of hardwood that is garnished with well-designed carvings on the stool and drawer. It also has anti-slippery parts that prevent the leg from scratches in the bottom. 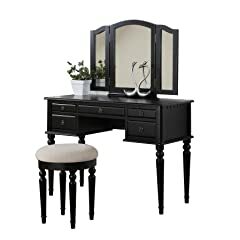 This elegant Modern vanity table comes with a stool, three mirrors, and seven storage drawers where you can store all your jewelry.The smooth tabletop provides space for cosmetics and beauty supplies and also includes a matching wooden stool. The table is flexible; you can easily move the top part of the table away asa study desk or a writing table.What Makes this Vanity Set So Great? You can quickly assemble the makeup table since the major installation has been taken care of by the manufacturers. It gives a classic elegance feel to your bedroom. The manufacturers are always responsive to answer any of your questions and complaints. The vanity lacks enough storage capacity compared to other vanities. It might come with minimal scratches on some hidden parts. If you’re looking for a white vanity set that has the perfect match for your dresser, this vanity set with stool always comes to mind. Bobkona Jaden Collection Vanity Set with Stool comes with an engaging style of elegant décor that is made of wood and fabric. The vanity has an attached mirror with a moveable extension and a portable drawer table to store and display your accessories. The vanity desk comes in a variety of beautiful colors with a bench seat padded in a solid color cushion. The makeup vanity table can be very easy to assemble with an easy to follow guild. The product is securely packed. So you don’t get to see any scratch on the vanity. You can get your vanity shipped to you within a short period of 2- 7 days. The vanity table with mirror takes few minutes to put together as the set had been pre-assembled by the manufacturers. Most of the holes at the back of the table are not pre-drilled. It might take you a lot of time and energy to drill the holes. It is a small vanity set. 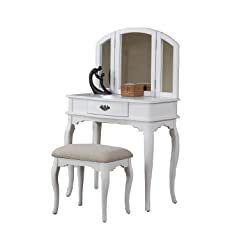 The Crown Mark Vanity is a cute vanity desk with mirror. The vanity is made up of high-quality materials and design that looks perfect for all size. The stool, spindles of the mirror and the frame are made from solid wood. The vanity set has a smooth tabletop that provides enough space for makeup and beauty supplies. The seat spindles of the mirror and the frame are made from solid wood. The vanity is very easy to assemble. The bench is made up of solid wood. The drawer is sturdy and of a high standard. The craftsmanship and design are excellent! The bedroom vanity set might come with a crack in the wood around the mirror. It can easily get stained. The Bedroom is among the most treasured rooms in the home. It’s the place where you’d dress, admire and accentuate your beauty. And the right vanity tables are crucial to women’s bedroom. Vanity sets serve to hold make-up, brushes, combs and other personal belongings. But with so many vanities sets out in the market, it could be difficult to know which one fits your room. So how do you get to know the right vanity set? Start with these seven tips you can use in buying the best makeup vanity table today. What Is the Purpose of the Vanity? Choosing the best vanity tables require the right knowledge and careful consideration. You’d first have to decide the aim of the piece. Whether it’s for a functional purpose or you want it to be more attractive. You should also consider the rest of your bedroom pieces as well as whether you want the piece to be modern or conventional. Next, let’s look at the material. If you’re planning to buy a sturdy makeup table, without taking into account the material of the vanity, good luck! But that’s not going to happen! Do you want my advice? It’s simple. Always go for vanities that have the right material! Find out what others have said about the product. Is the vanity made of solid wood? Is it durable?Will it be able to carry you for a long time? These are few questions you should have in mind when choosing vanities that come with the right materials. Also, if you are searching for something more modern, you should able to get vanities that come with mirrored surfaces. You might also consider a metal structure with an elegant finish like nickel satin or nickel bronze. The stuff from which the vanity is made may have some benefits or drawbacks. For example, metal materials are durable. Wood also can be durable, but it can also be more vulnerable to scratches and other forms of damage that could mar the beauty of your vanity table. Also, you can get some unfinished designs from different types of material if you want to customize the appearance of your vanity desk. If your desire is to go for functional vanities or if you want something that is simple and modest, then check contemporary pieces which use minimalist design. They have a clean and clear appearance. If your bedroom uses modes and simple style, then this would be the right piece for you. The vanities should have excellent features like drawers, mirror, and countertop. Among cosmetic vanities, you could choose traditional wood sets, wrought iron or Victorian pieces. The classic style set can stand as highly decorative and functional. They still retain their elegant designs and decorations but won’t have detailed additives and intricacies. Also, the Wrought iron set and Victorian pieces would be more delicately ornate and carved. They can be quite heavy and expensive as well. Metal sets would be light weight and costly and yet classy. You should try as much as possible to know the size of your Bedroom before making a purchase. So, consider how much storage space and counter space you will need. Ensure to take note of the measurement of the area where you can install the bedroom vanity. You can have more freedom in choosing the height, although the width and depth tend to be fixed measurements as a result of the actual space in your Bedroom. While you may find different kinds of vanity set that are quite attractive, you should consider, first, the preexisting decor of your bedroom. If your room has wooden furniture, you may need to make sure the wooden vanity table, fits nicely with the wooden furniture in bedroom room. A lot of people go for corner vanities as it offers a suitable spot to keep things without consuming too much space. This type of makeup vanity will be perfect if your bedroom isn’t all that big in the first place. If there’s one thing you should take note of when choosing the right vanity table for your bedroom is design! So buckle up, settle for a good looking vanity. Before buying a vanity table, you need to know the different designs and styles. Nearly all vanities do not come with faucets. Most vanity tops come with pre-drilled holes, depending on the design. So, go for vanities with a pre-drilled hole which will be easy to assemble. You can get a nice set of vanities for a few hundred or thousands of dollars. But, it depends on the quality of the vanity table. 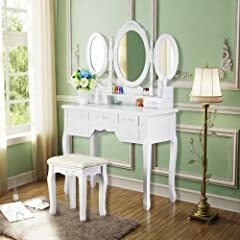 Some of these makeup vanities come with some drawers and a well-designed mirror; others provide a small table space for placing odds and ends. However, you will always have the option to save a good sum or get an upscale bedroom vanity set with discounts, coupons or other promotions. Check the pre-existing decor of your room. As a buyer, you must ensure you get the best value for your money. This includes getting comfortable with the seven steps in buying the right makeup vanity table for your bedroom.